If you are looking for a place to spend a weekend, a week or a month, to get-away, relax, yet be close to so many attractions, this is the place for you! Easy access, paved road. Enjoy the solitude and relaxation of the Great Smoky Mountains in our new cabin. You can rock the day away on your private elevated porch, listening to the rushing waters of the Little Tennessee River flowing nearby. If you are in the mood for activity, we are close to gem mining (Franklin is the gem capital of the world), The Appalachian Trail, Cherokee Indian Reservation, Harrahs Casino, Great Smoky Mountain Railroad, Blue Ridge Parkway, Biltmore Estate, and Nantahala Outdoor Center. 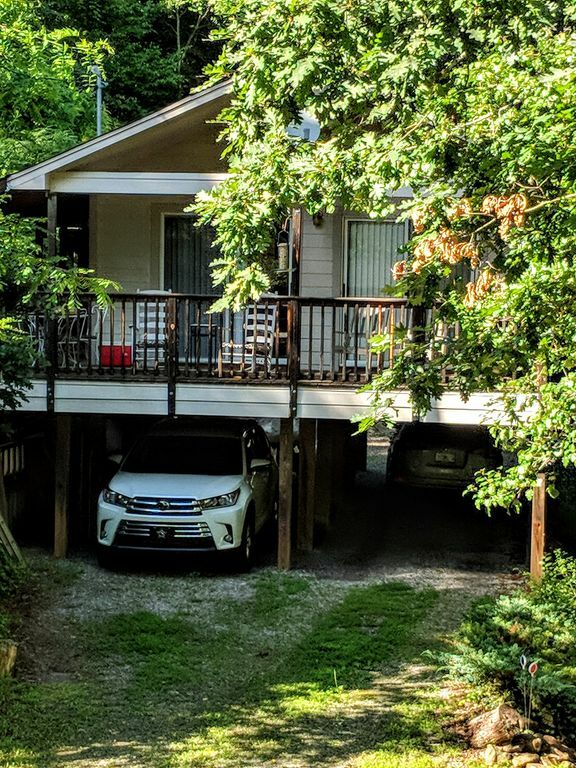 We are secluded enough that you are away from it all, yet within an easy drive of two major towns (Franklin and Bryson City). Our cozy cabin is fully furnished, all you need to bring are the groceries. Brand New Leather Sofa in living room. WIFI is available in the cabin. We have a picnic table and grill for those meals you want to enjoy outside, however, if you want to eat out, we have many wonderful restaurants in Franklin and the surrounding towns. Seasonal view of the river. River can be heard from porches year round. Local calls only or calling card for long distance. We hardly saw them at all yet we knew they were right there if we needed anything. Owners were very close by and nice. Kitchen stocked well. Franklin was fun. Recommend Rel restaurant for lunch or dinner. Can bring your BYOB!! Rare in today's world and saves $$. Great little cabin, like living in a treehouse! Our stay was quiet & relaxing, the place was clean, neat & cozy! We enjoyed the barbecue on the covered deck & eating out there. Loved being able to cook breakfast in our kitchen & eat it on the porch as well. It was not too far into town or to go hiking & visit the waterfalls. Loved being able to kick back in the recliners & watch TV after a full day out sight seeing! The hosts were very nice, were close by in case we needed anything! We thank you so much, we do want to please. Hope you return. It was more than we expected ! It's wonderful meeting guest who become friends, and a part of your life. The owner was very accommodating and the cabin was a perfect getaway with my husband! The location was great, just a short drive to where we went white water rafting and zip-lining. And the following day we drove to several different waterfalls that were absolutely beautiful. THANKS, we appreciate your business and kind words, the pleasure was ours. Wonderful location nestled in the trees like a treehouse from the balcony! We enjoyed the well appointed cabin with a balcony in the trees surrounded by birdcalls and river sounds. The cabin was cozy and comfortable with everything we needed. Jo and Rup were welcoming and accommodating.Would definitely return. We appreciate the kind words and your business, hope you return.